Leaving China was not fun, a disappointment after the great find in Lijiang. An early rise, long trip to the “new” airport (that’s about an hour plus), short flight to Kumming (monster airport), transfer to car with driver for a six hour frustrating drive. The highways the government has built are extraordinary. But the use of them is weird. Any car, truck,van transporting tourist is being monitored by a GPS system.There are cameras every few miles to check on the vehicle. The driver can only go about 30 miles an hour on these fabulous roads - while locals whiz around you at whatever speed. ( But honestly, there was hardly any vehicle on the roads for the whole jaunt. )Then you hit the tunnels - tunnels like I’ve never seen that are top of the line, if tunnels have top of the line. But, in a tourist car, tough - you creep through the tunnels like you are on your knees. 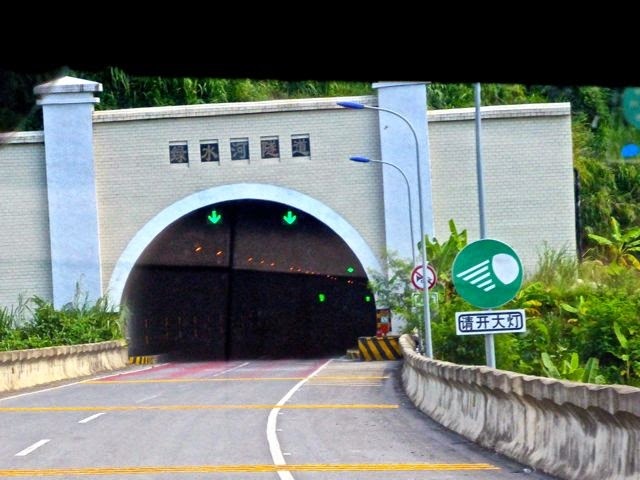 Tunnels take short cuts under mountains. We crept through at least 25 miles of tunnels - some short, some long, some endless, it seemed. But only at 30 mph. I was ready to jump not only out of my skin, but out of the car. It took 6 hours plus to travel 200 miles. And there were only two rest-stops (i.e. food and toilet) on the way. Of course no one tells you this. They tell you how you’ll drive through the great tobacco land, and the casava farms and rice paddies, but trust me, it doesn’t hold your attention. On the road, we braved a stop at what would be considered a Cafeteria style place for travelers - you had a choice of a number of spicy dishes and wok cooked veggies and tea, of course, was an automatic, and in a “shop” next door there was packaged foods - all Chinese, none making sense to me - although there was an ice cream bin where you could get a cone or a eskimo bar type thing - (there is a real reluctance to “cold” foods here in all of Asia - a health thing - Lordie, I miss my ice machine). Ask for a glass of water on an airline, it is hot water in a glass. After this tedious drive, trying to slide into China-Vietnamese immigration (where one has to drag their baggage up the stairs to the site and that’s a problem when you have heavy bags trailing you ) we were stopped before the border by some young police who either wanted to look at our passports filled with colorful visas or just wanted to make a stir - and finally got away, then had to drive through the border town to get to Immigration and the famous Friendship Bridge. One relief, they had a one-way “Up” escalator. 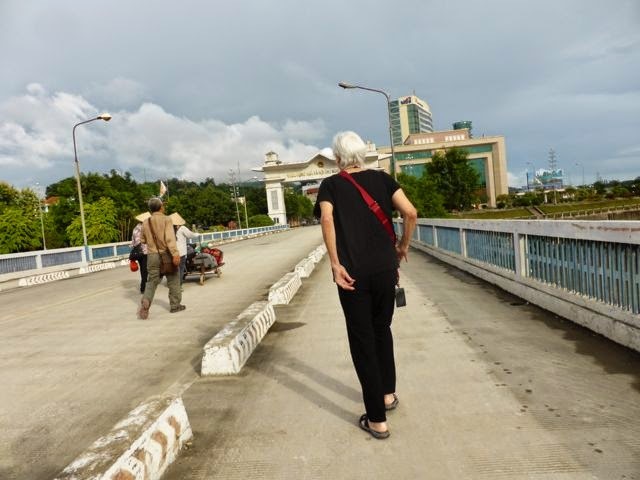 Then we had to go to the quarantine desk to get a stamp, then get in a long line of folk trying to make their late in the day crossings into Vietnam (possibly workers) - and of course having American passports, we caused a stir and lengthy inspection. And thanks to A&K, they had hired some locals to meet us and get our bags up the stairs and through immigration and to the other side. In fact, at one point, everything disappeared because they had already pushed through to the other side, but we didn’t know that, standing in our line. Finally after inspection security and the proper stamp, we made the walk across the Friendship Bridge. And on the other side, after another line, and a few questions - we could see Dang our guide waiting outside with his yellow sign - we finally breathed a sigh of relief. I don’t know why. I really was enchanted with China, and except for the blockage of stuff related to the digital age to keep information controlled and my friend Ai WeiWei tied to his studio, it was an open, welcoming, impressive country. But, I was relieved to be in friendly Vietnam. 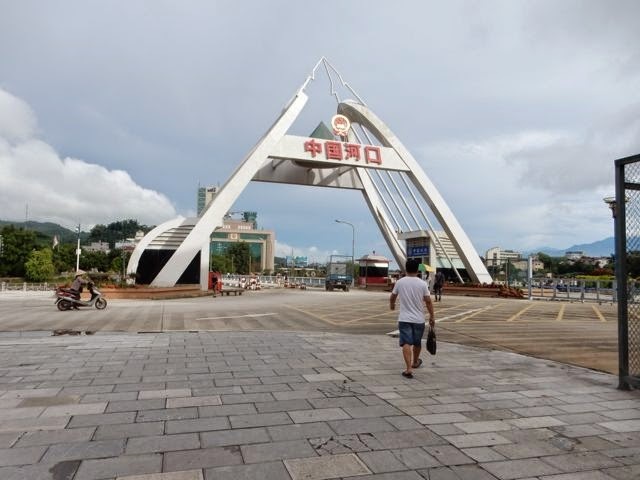 Our guide and driver led us to a pit stop in Lao Cai, and hungry as I was, I stooped to Americanism and had some french fries to go in a normally legit Vietnam restaurant. Then came the zig-zaging , fainting against trucks, buses, guinea fowl, water buffalo, motorcycles, large vans like Boxers, curving, on a breath-stopping road one and a half lanes that thinks it is a four lane, for 25 miles up into the Torkinese Alps. Nearby in these Alps is Fansipan, which is the highest mountain (10,000 plus feet) in all Indochina/Southeast Asia. 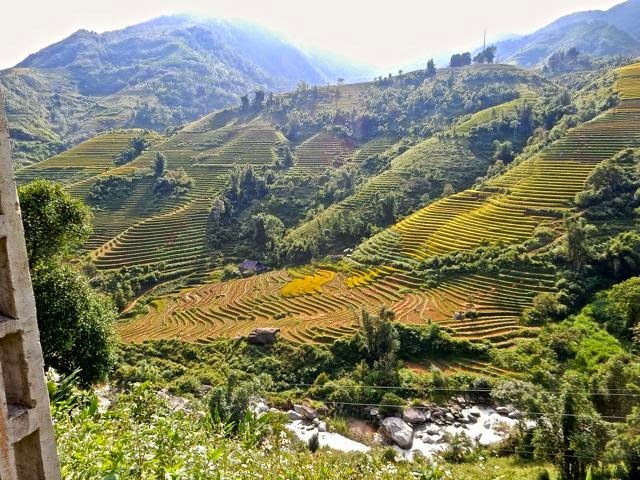 Half ways up its slopes covered in gum trees, banana leaves, ferns, casavas, rice paddies is Sapa, the destination, at about the 5000 feet high level. So it’s cool but you are woozy from the quick change. The hour drive which we made various times, slinging back and forth in the van like we were on a Disney ride, took us past the most amazing terraced rice paddies I’ve seen. It is harvest time so the fields were a nice sunflower yellow. Interestingly, the more steps up a hillside, the longer the family has been working. Usually they add two or three layers a year. There were farms of about 150 layers from bottom to top of hill, so this says the family has farmed there probably 150 years. It’s a grand testimony but there is still not a lot of money in the rice growing business. To make good profit, a farmer needs three crops a year. In other countries (Thailand, Burma, Lao, Cambodia and most of Vietnam grow wet rice to harvest every 3 months. They need water in fields and this has to be a community activity, not just one person, although farmers still transport water by hand. ( Dry rice only produces a crop in 7-8 months. ) The best part of this is that it builds a community that knows and relies on each other. When there is a wedding or funeral, no one has to be invited. They just show up, because it’s “family.” This is the core value of Vietnam. It takes a village to grow wet rice. 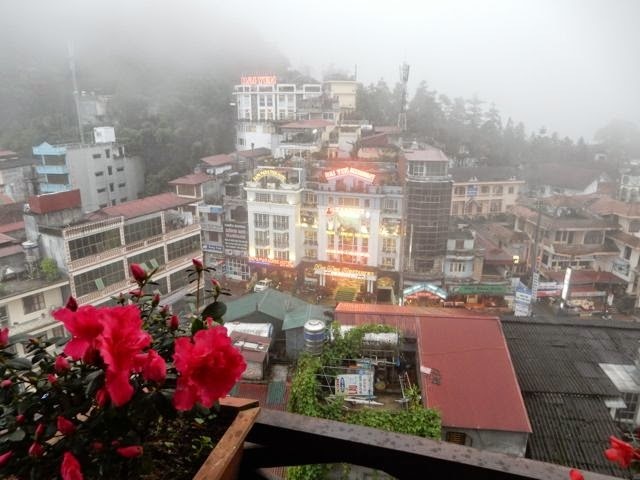 Once we reached Sapa, which we had chosen to visit to see the needlework so famous from the hill tribes in this region, we parked at the Victoria Hotel, an old French resort from when it was a Hill station (the French were Vietnam’s colonizers.) It hangs on a cliff, like much in these parts, but down below is a lake with swan boats, lots of karioke possibilities, restaurants and neon lights. Noisy it is. My room had a balcony overlooking the town and there was something going on the microphone until darkness fell. This was an old hotel but well furnished. The dark wooden floors are so old they creak every time you take a step. Steps needed to be climb to get to the rooms and mine was on the third floor. This is the first place where brushing teeth with the water is a no-no. I wasn’t warned. Since that fatal night, I’ve spent more time in the toilet than on travel. The Crud. Your drive apparently was very tedious! Too,too slow! But when you weren't in the tunnels, the scenery must have been beautiful. We really like the photo of the terraced rice paddies. By the way, we are saving your photos from this trip in a folder in our iPhone. We aren't familiar with the Friendship Bridge, so we'll use Goggle to learn more about it. 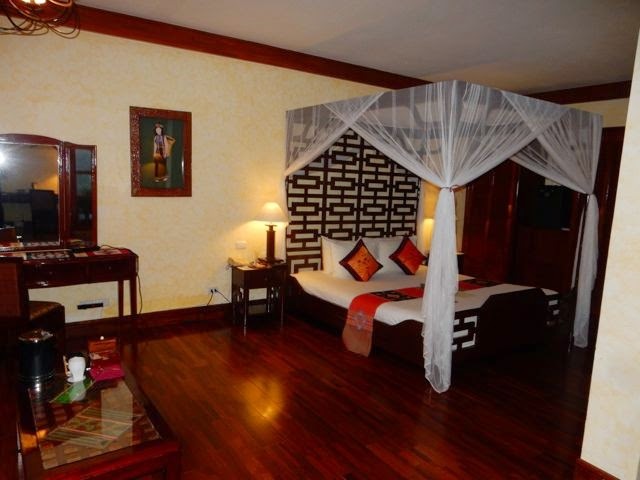 The furnishings, especially the bed, in your room at the Victoria Hotel were really pretty. Hopefully you enjoyed having some comfort in spite of the water. Take good care of yourself, but be careful where you brush your teeth.